West Cork begins in the town of Kinsale and ends at the tip of Beara Peninsula with numerous towns in-between such as Bandon, Bantry, Skibereen, Clonakilty and Castletownbere. While traveling through West Cork it’s said to feel like you have the whole place to yourself. 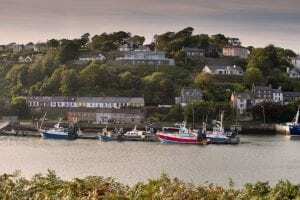 Starting off in Kinsale, take in the beautiful harbour town covered with colourful streets filled with history, tourist attractions and world- renowned restaurants. Experience one of the many water sport activities Kinsale has to offer, from surfing to sailing and if you prefer to remain on land why not cycle one of Kinsale’s quiet roads known for its challenging cycling.